As spring time turns to summer, and the flowers begin to Bloom…the smell of Pretzels and Bratwurst is in the air. Yes indeed, it is that time again, where only the ice water in the veins, steel hearted, large bellied men begin the annual preparation for the pilgrimage to zee Faza Land. Schwag has been ordered, flights have been booked, and training for the once in a life time event (which by the way has become an annual life time event) is underway all across the globe. The Rookie class for the Hacker Herren 2011 group is stacked this year with an international flair, including two rookies from Germany itself. Now I know that you are asking yourself how we can have two “Rookies” for Oktoberfest that actually reside in Germany. Rest assured that the classification of rookies had to verified by the I.O.O.R.C.F. committee. 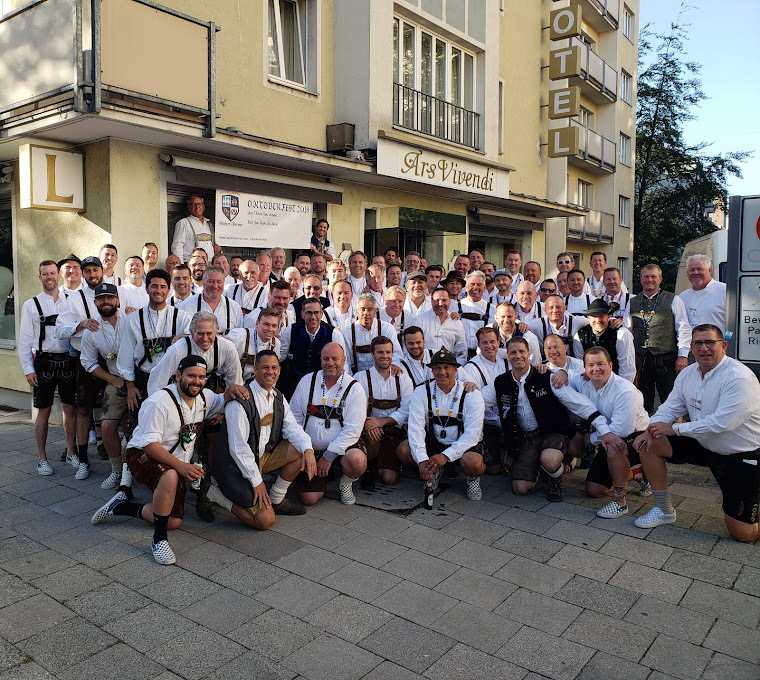 The International Oktoberfest Organization for Rookie Classification Federation did extensive background and PEDD (Performance Enhancing Drinking Drug) screening, and confirmed and accepted the petition for Rookie classification from both members of the German contingency. Though team Chicago filed a last minute injunction to block this status, the 9th court of appeals within the Hacker organization denied the request, and both are entitled to compete this year as rookies for the 2011 class. While they may have the backing of the hometown crowd, the competition is going to be fierce, and only the best will rise to the top and claim ROY 2011. Here are the odds as put forth by the Palms Casino in Las Vegas. 100-1 Eleven (Rob Venema). Does the apple fall far from the tree? We are about to find out. Brother to ROY 7, Eleven is bold enough to already shorten the title, and put the bulls eye squarely on his back. There has never been a repeat of family members for the ROY award, and this year we feel the odds are again stacked against that happening. Most Damaging to his claim of ’11 is that it took a cancellation of another member to get him to step up for the trip. One wonders was he shamed into going and is his heart really in it. 99-1 Wookie (Curtis Davis). Although Wookie thinks that he will not look out of place in his Lando Calrissian outfit inside the tent , he is in for a big surprise. Leave your light saber and warp speed at home Wookie, you are going to need more than the Force to navigate this galactic party. Sure, you may have won the Federation’s highest award at the last Star Wars reunion convention you attended in Los Angles, but this is a party for the big boys. Be thankful that you won’t have to deal with any Storm Troopers and you won’t have to deal with the title of ROY ’11…because the force is not with you. 75-1 BeanO (Tim Lima)- While we applaud the amount of activities that BeanO is trying to squeeze in to this get away, he may have bit off more than he can chew. Berlin a couple of days prior to Munich. Munich for two days. Return to Berlin to run the Berlin Marathon on Sunday! Awesome training schedule, but this award has to be accepted in person and present in the tents on Saturday , and unless the course takes you from Berlin back to Munich….thanks for coming. We suggest that you make the most of your time in Berlin, because you will be going hard for the 2 days that you will be in Munich. 50-1 Steele (Brian Steele) While he won’t win the ROY 2011 award, he does win this year’s award for using his last name as his nickname. There is one every year. 25-1 Auslander (Johannes Lange). Sled 2 of the German “rookies” , Auslander has a tall order. Much like the German soccer team coming so close to winning the FIFA cup in 2002, we fear that with the weight of the country riding on him, Johannes will shoot…..and miss just right of the goal. Fear not, because he will give it the “ole German try” and represent Deutschland well, and return back home a country’s hero. 23-1 Yimmy (Jim Arnold) Guest of Doid and Oroczo, Yimmy has surly been prepped for what is to be expected and we hear has been training since he hit the confirmed button on his paypal account to submit the money. Other nick names considered “Yimmy crack corn” , “Yimmy the Greek”, and “Yimmy Cricket”. 20-1 1st Pitch (John Marrone). This guy likes a big stage….and O’fest fits right into his wheel house. Having thrown out the first pitch at last year’s World Series for the Giants, 1st pitch is no minor leaguer. He is said to have a full arsenal in his line up and is expected to be able to take it deep into the night. No relievers needed here. We don't know from which side of the plate he swings, but he has major league talent, and is looking to dominate the competition. 18-1 Mikey Likes it (Mike Swartz). Although there was some concern on the Mikey/Mike relationship, M.L.I. is said to be going through Jason Green's, Introduction to Ofest Training course. This 16 week training course has stringent requirements, including tasting 25 different types of German beers, wearing lederhosen to all family events leading up to departure for Munich, and Sausage at least 10 times per week. After completing a healthy serving of white sausage for breakfast, it was said that you could hear him mumble “Mikey likes it” under his breath. 15-1 Vinny (Vince Boyanich) and Hammer (Stephen Spurling). Both Hammer and Vinny are flying under the radar. Quiet, reserved, and stalking their prey, Hammer and Vinny are rumored to have started a tag team approach to knocking off the other rookies one by one. Vinny is using the Maxim shipping department as a front to run his plan of discrediting all the other rookies with mass mailers, and orchestrating propaganda leaflets to be dropped over the tents claiming victory for him. 10-1 Carpe Diem ( Jeff Carpenter). Loosely translated, Seize the Day. He could really vault himself to the top if he can Carpe 7 hendel. Carpe schnitzel. Carpe Pizza. Carpe fraulein’s. Carpe Berman when he gets thrown out of the tent. And Finally Carpe a round of beers for the table. 8-1 B-Share (John Palmer). Getting taken to ofest by Blackout is like receiving communion from the Pope. You have the connection. You have the skill. And you have the “it factor” . Palmer, as it goes, is a man among men. Blackout has groomed him for years just for this occasion. And let’s face it. If the powder blue warm up suits didn’t scare him away, like Randy Jackson says on American Idol..”He is in it to win it.” And team Chicago has never disappointed. 7-1 Worm (Kevin Bresser). Similar to B-Share, when you have Joe Sanchez backing you, you automatically command a presence in the club house. One small issue here. How or what gave him the nickname worm. While the stories are viral on the internet, TMZ, and Dead Spin.com all citing to have knowledge of the situation, nothing has been confirmed with any photos backing up the visual when you see and think “worm”. Possible better names for next year are Python, Snake, or Boa. 2-1 Woody (Christopher Wuttke). Woody is officially sled one for the German Team. Woody has been drinking steins since he wasa little boy running around with lederhosen diapers on the family farm raising Bavarian Hops. His pastimes are raising German Shepards, playing soccer with Franz Beckenbauer and Lothar Matthaus, and of course drinking more beer. The town in which he grew up erected a statue of him drinking beer, and every summer, the town gathers around to drink more beer with him. He has children, who are already practicing drinking beer and raising German Shepards. Woody hopes that someday he can become a professional beer drinker in multiple European countries. 2-1 Z Meister (Tim Zingraff). Z Meister carries the weight of the west coast and past ROY’s Vonderach, Dickinson, Mimran, 7, and the original ROY, Der Stinker as the best viable chance of returning the coveted Green Hat to its rightful location on the Left Coast. Z Meister originally hails from Indy, and as you know, other than some race, the only thing to do in Indy is Drink. Tim worked tirelessly over the last 21 weeks to increase his consumption intake by joining a bowling league. He is traveling early to Berlin to acclimate his palate to the German Beers. He is all business when it comes to representing the Hoosier pride. Tim is going to run the picket fence, and he hope to not get caught watching the paint dry.